Also how can I get the app to make the typical sound when opened like it did on BB10. Got any screenshots? And is it all articles or just ones that have the KEYone info box at the bottom? No all of them are like that. Unfortunately I have no screenshots because I have no idea how to take a screen shot with the DTEK50 ...The Forums though are OK..
A quick Google search could've easily answered your screenshot query. Or just typing in screenshot in the help app loaded on the DTEK50 since it's just an embed of that site, but alas. @adonesc That's not right for it to be on all posts but w/o seeing it, not really sure. Try the new beta release and let me know if that changes things for you. Does the Messaging app start off in "CAP LOCK" mode like it does on my 60? 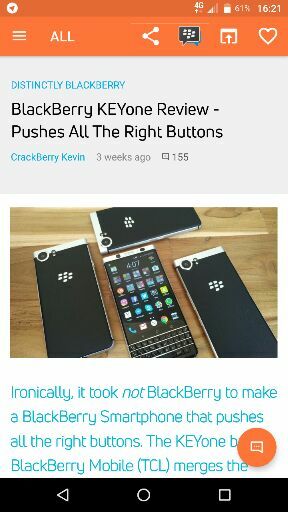 will shop crackberry US and CA sell the KEYᵒⁿᵉ? CrackBerry Asks: BlackBerry Convenience Key - How Important of a Feature is it?